MI5's application to have German spy Josef Jakobs tried by court martial had been accepted by the Attorney General in late June. The officers of MI5 had anticipated that the court martial would take place within two weeks of the AG's approval but there was some difficulty in arranging military prison accommodations for Josef within London. Thus the proceedings for Josef's court martial were delayed significantly. court martial of Josef Jakobs. (National Archives - WO 71-1240). Finally, on July 22, 1941, with all of the ducks firmly in a row, Josef was attached to the Grenadier Guards for disciplinary purposes. A week later, on July 28, a Summary of Evidence was held at Wellington Barracks under the direction of Major Anthony Marlowe, the barrister who would also serve as the Attorney for the Prosecution. The various witnesses read out their statements and Josef was given a chance to cross-examine them if he so desired. Given that an interpreter was not present, nor a defence lawyer, Josef had little to contribute to the proceedings. 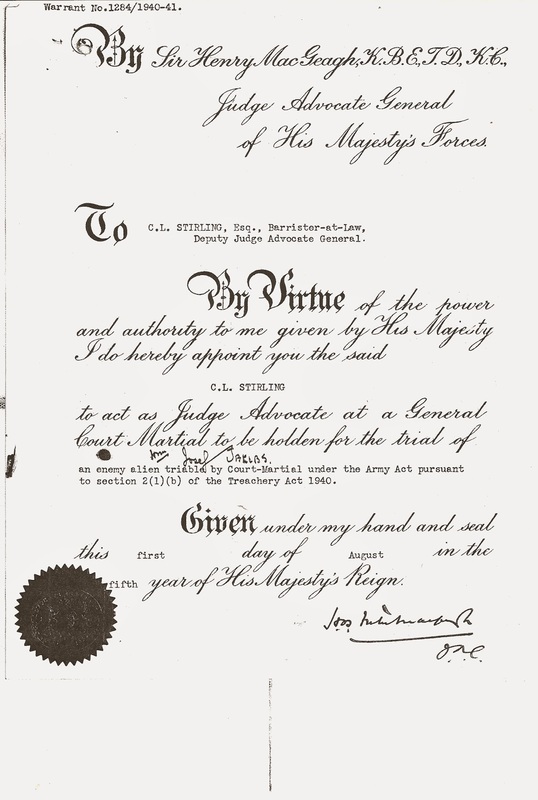 Finally, on August 1, 1941, the Judge Advocate General, issued a warrant appointing the man who would act as Judge Advocate at Josef's court martial. Carl Ludwig Stirling was a Barrister-at-Law, a civilian who served as the Deputy Judge Advocate General. It would be his job to ensure that all of the intricacies of British military law were followed during Josef's court martial. He would also present the summing up of evidence before the members of the court decided Josef's fate. Stirling would play a key role, not only in Josef's court martial but also in the trials of many of German's war criminals. Despite his German-sounding name, Carl Ludwig Stirling was born November 10, 1890 in Manchester, England. His father, William Stirling, was a physician and professor of physiology at Manchester University. Carl's mother was Elizabeth Ferguson Crawford. Both of Carl's parents had been born in the same year in the tiny village of Bothkennar, Stirlingshire, Scotland. Carl was the youngest child in the family with one sister and one brother. Carl's father was obviously well-do-to for the family employed several servants. Carl's mother often took the children north to Scotland to visit her relatives in Bothkennar. Her family, too, was quite well off, with her eldest brother managing the steamship company inherited from their father. While many of his contemporaries studied at Oxford, Carl chose to go to school closer to home, attending the University of Manchester and Belfield Lodge, Fallowfield. Despite this rather provincial education, Carl was called to the Bar of the Middle Temple in London on June 4, 1913. Unlike several of his legal contemporaries (AG, JAG, DPP), Carl did not end up fighting in World War I, although he did join His Majesty's Forces. On January 16, 1915, Carl received a commission as a 2nd Lieutenant in the 2nd (City of London) Battalion of the London Regiment (Royal Fusiliers). On October 15, 1915, dressed in his dashing Royal Fusiliers uniform, Carl married Fenna Kemp Fenn Smith at St. John the Evangelist Church in Wembley. Fenna was born in Durban, South Africa in 1894. Her father George William Kemp Fenn Smith had joined the Cape Mounted Rifles in 1883 and been deployed to South Africa. After his discharge from the Rifles, he remained in South Africa as a mining engineer searching for gold. He returned to the United Kingdom to marry Louise Rose Roberts in 1893. George and Louise traveled to South Africa where Fenna and her youngest brother, Warren were born. The family traveled back to the UK on occasion and in 1896, Fenna's middle brother, Gurth. was born. George died in 1901 in South Africa and his wife and children returned to the United Kingdom for good. Fenna had two brothers, Warren and Gurth. Warren joined the Royal Flying Corps and was killed in action in mid-January 1918. His brother, Gurth, originally joined the Royal Dragoons but in mid-1918 transferred to the Royal Flying Corps. Carl and Fenna wasted no time in beginning their family. A daughter, Pamela was born in September 1916, followed by a son, William, a decade later. From 1916 to 1917, Carl sat on a series of Military Appeal Tribunals in Devonshire. Individuals who requested an exemption from military service had to present their case before the tribunal. Carl was a rather unsympathetic ear and quickly developed a bit of a reputation as a bully. In his opinion, young men should be serving their country overseas not trapping rabbits and herding cattle. Despite this reputation, Carl was promoted to Temporary Lieutenant on June 1, 1916, and to full Lieutenant on October 17, 1917. Little can be deduced from Carl's activities during the interwar period. We do know that on February 12, 1927, he was appointed a Legal Assistant to the Office of the Judge Advocate General. At some point he also "took silk" and was appointed King's Counsel (later Queen's Counsel). He was also invested as an Officer of the Civil Division of the Most Excellent Order of the British Empire. On August 4 and 5, 1941, Carl served as the Judge Advocate at Josef's court martial. Carl opened the proceedings and closed the proceedings with a summing up of the evidence. On January 1, 1943, His Majesty the King was pleased to make Carl a Commander of the Civil Division of the Most Excellent Order of the British Empire. Carl really came into his own, and achieved a fair degree of notoriety, for his role in the war crimes trials that took place after World War II. Carl served as Judge Advocate for many trials, including the Belsen Trial (trial of Belsen and Auschwitz concentration camp personnel) as well as the trial of British personnel accused of the ill-treatment of German prisoners at the Bad Nenndorf Detailed Interrogation Centre, the camp commanded by Lt. Col. Robin William George Stephens (formerly of Camp 020 at Ham Common in southwest London). after World War 2 (From The Guardian). 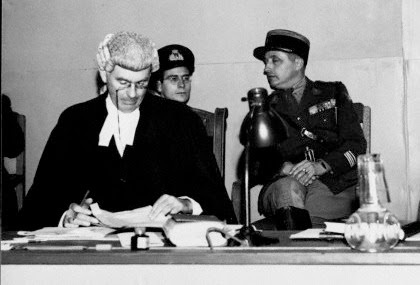 In a strange twist of fate, Carl was Judge Advocate not only at Josef's court martial in 1941 but may also have been the Judge Advocate at the court martial of Stephens in 1948, the man who had interrogated Josef at Camp 020. While Stephens would be acquitted, Josef was not so lucky. As for Carl, after the war crimes trials he faded into the background before eventually passing away on July 6, 1973 in Taunton, Somerset. Ancestry.co.uk - genealogy records - births, marriages, census records, military records. 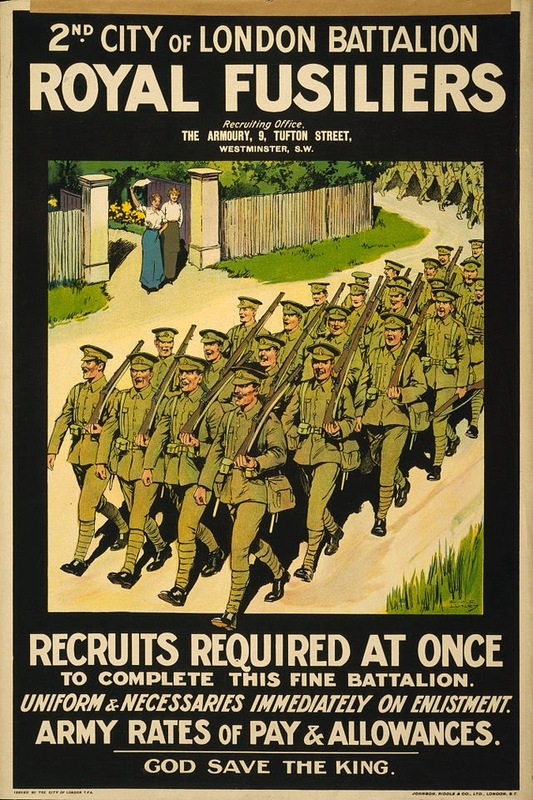 Devon and the First World War - by Richard John Batten (pdf document). Imperial War Museum - collection of private papers of C.L. Stirling. National Archives - War Office file containing transcript of Josef Jakobs' court martial (WO 71-1240). Rootsweb - forum thread on William George Kemp Fenn Smith.